Get free advice and estimates from electricians in your city. For the last several years, federal guidelines dictated the phasing out of incandescent, or traditional light bulbs, which use more electricity than other types of bulbs. 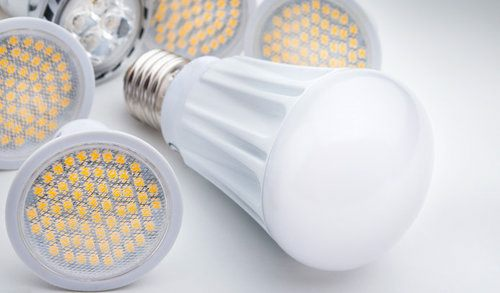 In the wake of these guidelines, many different types of light bulbs have come on the market, including Compact Fluorescent Lights (CFLs) and Light Emitting Diodes (LEDs). Both are considered more energy efficient than incandescent bulbs and have positive and negative attributes. We’ll outline the differences below so that you can determine which will be a better fit for you home and lifestyle. Traditional bulbs work by passing electricity through a filament that glows. But CFL and LED lights work differently. LED lights are considered a solid state lighting bulb (SSL). This means that instead of generating light and heat through something, they produce light through diodes or semiconductors. These conductors are known as a p-n junction 1, where positively and negatively charged ions meet. They force the electricity to run in a particular direction, which produces light. If the wrong type of voltage is supplied, you may hear a buzzing sound when using a dimmer meant for incandescent bulbs. Therefore, if you are switching to LED bulbs, you may need to replace your dimmer switches. CFLs are a type of fluorescent light, a smaller version of the long tubes you may be familiar with in commercial settings. The light is filled with a combination of mercury and argon gas. When electricity passes through them, they emit a type of ultraviolet light, which interacts with a fluorescent coating on the interior of the bulb, which in turn produces visible light. Unlike LEDs, CFLs do not produce a buzz or hum, but they may not work at all with some dimmer switches. CFL lights are available in a broad spectrum of colors and types of light. They are most commonly found with a bright white light similar to traditional fluorescents, but they can also be found with colors more similar to incandescent lights. LED lights once produced only one type of light, but they are now available in a wider range of colors as well. This is accomplished by changing the types of semiconductors used in the bulb. When the materials change, so do the colors. In previous years, you could only find LEDs in a single color, but now you can find them in the same spectrum of shades as CFL lights. Keep in mind that both CFL and LED lights may not be compatible with all dimmers or 3-way switches. Switching to LED or CFL lights is simple, and often requires no modification to your existing fixtures. However, if you choose to use a dimmer switch with either type of light, you will need your dimmer changed out by an electrician, at a cost of around $65 to $85 an hour, with most projects costing around $70. If you have a new fixture installed and want a specific LED or CFL light base, this is easy to do. The old fixture can be removed, and the new one installed for around $130 a light. 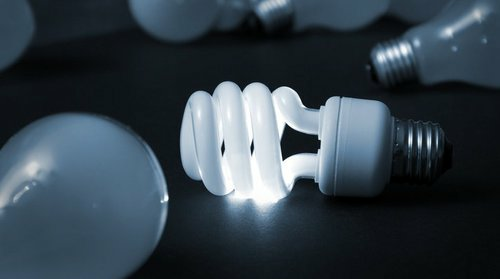 CFL bulbs cost around $22 for a pack of six bulbs, while LED bulbs cost around $30 for the same number. If you choose to install a new fixture that will match either of these bulbs, the cost is usually around $10 to $20 for recessed light 2 cans, which is the most common type of fixture installed today. Installation for each can runs around $130. The biggest cost difference between the two is in the bulbs themselves, not for the fixtures or installation costs. Both LED and CFL bulbs use considerably less energy than traditional incandescent bulbs. LED lights use approximately ⅓ of the amount of energy of CFL bulbs. CFLs use around ¼ of the amount of energy that an incandescent bulb does, making it an energy-efficient choice. LED lights use only 3% of the energy of an incandescent bulb, which lowers your energy bills even more. Because of the way LED bulbs are created, the light they produce casts in a single direction. Therefore, they work well as under cabinet lights, as well as in track lighting and some types of recessed light 2 fixtures. They are not always suitable for table lamps because they do not cast consistent light. For these purposes, invest in what is known as symmetrical LED lights, which are LEDs that have a diffuser to cast the light evenly around the room. These lights often have LED clusters inside that produce light in a variety of directions, making them easier to use anywhere. Always check the label to determine which type you are purchasing. CFL lights have more even lighting throughout the bulb, which is more consistent with incandescent lights. For this reason, they work well in many settings, including table lamps. They are also not good directional lights and do not function well in spotlight situations. CFL lights last approximately 10,000 hours. This assumes, however, that once the light is turned on that it will stay on for about 3 hours. Turning the lights on and off frequently reduces the lifespan of the bulb. LED lights last up to 50,000 to 100,000 hours, and they have no restrictions on the number of times they are turned on and off. While they are more expensive initially, they save more in energy and replacement costs. CFL bulbs use a mixture of argon gas and mercury. The presence of mercury means that you cannot dispose of the bulbs in the trash. They must be taken to a recycling center that deals with heavy metals to avoid environmental contamination. Mercury can be poisonous and dangerous. If a bulb breaks, sweep it up immediately and dispose of it in a sealed plastic bag at your local recycling center. LEDs do not contain mercury and are therefore less hazardous. They can be recycled or disposed of in standard ways. And, because of how efficient they are, LED lights help reduce overall CO2 emissions. Currently, estimates are that as much as 6% of the current greenhouse gasses are produced by lights. If you use what is known as a bare spiral CFL, you need to place it in an enclosed outdoor fixture to protect it from the elements and temperature shifts. Because CFLs are gas dependent, lower temperatures could produce lower light levels. LEDs can be used both indoors and outdoors with no restrictions. 2 Recessed light: A type of recessed lighting where the light is installed into a hole in the ceiling, giving downward light. How much does it cost to install CFL or LED bulbs in my city? Cost to install CFL or LED bulbs varies greatly by region (and even by zip code). To get free estimates from local contractors, please indicate yours.